Coral Reefs Articles -> Should Acropora spp. be Included on the Endangered Species List? TOn Jan. 15, 1999, the National Marine Fisheries Service (NMFS) requested comment on the possible listing of elkhorn and staghorn corals as candidates for protection under the Endangered Species Act (ESA). NMFS was considering listing the corals because their populations have been greatly reduced throughout the Caribbean range. Populations declined during the 1980s by up to 96 percent, according to the Federal Register notice. NMFS requested information that would either support or argue against inclusion of these coral species on the candidate list. Coral-list participants, which generally were equally divided on the issue, discussed the pros and cons of possible ESA protection for the corals, as well as the legal nuances of the act. The final participant summed up the lengthy discussion by examining the nature of the debate and the conflict between “reductionist” research and “holistic” research. Elkhorn coral (Acropora palmata) is a branching coral. Branching corals grow in the shallow areas of the reef crest and serve to break up the wave action as it comes onto the reef. 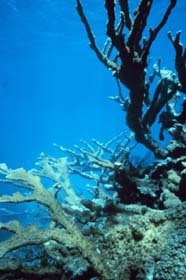 The branches of elkhorn coral resemble an elk's rack of antlers, thus its name. Participants in favor of listing the corals under the ESA generally agreed that such an action would be beneficial. Most agreed that taking an ecosystem approach to species protection would be more appropriate, but such an approach currently is not politically feasible. Therefore, scientists should use the legal tools they do have at their disposal, according to several participants. Elkhorn and staghorn corals provide beauty and complexity to the reef. Staghorn corals have declined in the Caribbean over the past 20 years. Some believe that their decline should afford them special protection as an endangered species. Several participants believed that ESA protection was not the best approach. One participant detailed several reasons for his opinion. First, state and federal statutes already prohibit coral harvesting. 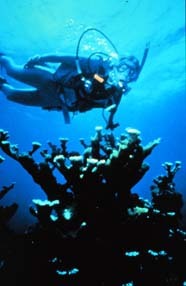 Corals also are protected within national parks such as Biscayne and Dry Tortugas. With such legal protections already in place, ESA protection would be redundant, according to the participant. In addition, it would be time-consuming and costly to prove that the corals are threatened or at risk, and the results probably would not satisfy the strict ESA requirements, the participant stated. Research indicates that coral populations are dynamic and experience frequent and periodic booms and busts—a characteristic that may hinder efforts to prove the corals are declining irrevocably. Moreover, damaging natural events such as hurricanes, bleaching and global warming trends will still affect corals regardless of legal protections, the participant stated. Another participant echoed this sentiment and questioned whether the current data indicates a significant decline. Some coral locations are declining dramatically, but others appear to be healthy, and reproductive capacity has not been shown to be declining, according to the participant. Numerous adequate legal protections are already in place. In addition, ESA protection is only binding in U.S. waters and would not affect other threatened Caribbean coral stands, the participant concluded. Staghorn coral grows as towering and branchlike formations and forms what some scientists call the forest of the reef. Some participants also debated the legal nuances of the ESA. Though some questioned whether the data on the corals was complete and substantial enough to merit ESA protection, one participant with a legal background discussed the act’s requirements and indicated that the corals may indeed qualify despite the uncertainty of their global health. For example, under the ESA, a species need not be threatened globally to be considered for protection. Rather, it need only be threatened throughout a portion of its range. In addition, application of the act relies solely on the “best scientific and commercial data available.” A species may qualify for ESA protection if data indicate that it is facing present or possible future destruction or modification of its habitat; experiencing overuse of its habitat for commercial, recreational, scientific or educational purposes; threatened by disease or predation; or jeopardized by other human or natural factors that would affect its continued existence. The participant concluded by cautioning that the legal arena is constantly changing, and certain questions regarding application of ESA remain untested until they appear in court.